Register here. To request ADA accommodations, please communicate your needs at least 7 days prior to the event. 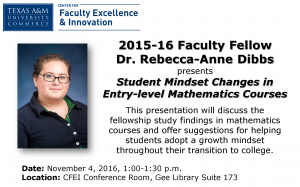 Email CFEI.FacultyDev@tamuc.edu or call the CFEI at 903-886-5511. Congratulations to the new Faculty Fellows! Texas A&M University-Commerce’s Pride Online just released this news. 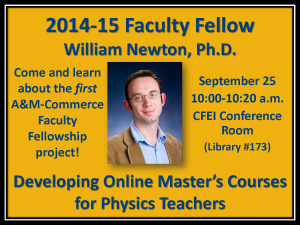 http://sites.tamuc.edu/news/faculty-fellows-announced-for-2015-16-academic-year/ Learn more about the CFEI’s Faculty Fellowships and the distinguished Faculty Fellows here.